Apprentice ironworkers from Local #86 with their instructors on a steel scaffolding where they learn their craft at Bates Technical College in Tacoma, Wash. The apprentices, who start at nearly $25 an hour, are among more than 200 the union is training as demand for them in the Seattle area picks up after a two-year lull. The apprentices earn college credit for the classes at Bates. TACOMA, Wash. — Five-foot-two Jesica Bush exudes confidence, whether she’s scribbling notes in a 6:30 a.m. class at Bates Technical College here or wrestling 900-pound girders atop a mock two-story building. With her blond ponytail tucked inside a brown hardhat, the 30-year-old is an apprentice with the ironworkers’ union, a job that starts at nearly $25 an hour and will lead her in three years to both a journeyman’s card and an associate degree. Three years back, Bush sat in the state women’s prison in Purdy, finishing seven and a half years for an armed-robbery conviction. The former addict dropped out of school in seventh grade — “Me and school, we never saw eye to eye,” she says — was convicted of her first felony at 13, had a child at 15, and was sent to prison at 19. Now Bush is one of 209 people learning the ironworking trade through apprenticeships like this one and others run by the Aerospace Joint Apprenticeship Committee, a state-funded partnership among community colleges, industry and the International Association of Machinists and Aerospace Workers, at a time when skilled workers are needed by Boeing and the rest of the aerospace industry in Seattle and to help build a $4 billion replacement for the floating 520 Bridge over Lake Washington. 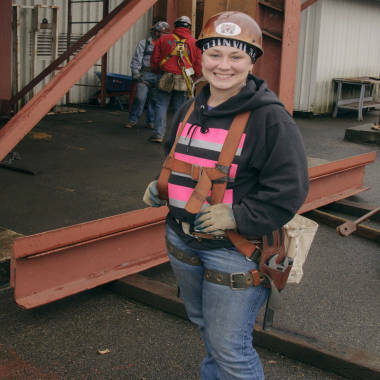 Jesica Bush, 30, who served 7½ years in prison for armed robbery, is now an Ironworkers Local #86 apprentice in Tacoma, Wash., making nearly $25 an hour and earning credits toward a community-college degree. From the White House to executive suites, and from think tanks to such industry groups as the National Association of Manufacturers, there’s a push to link apprenticeships with conventional education, mostly at community colleges, and produce a better-educated workforce capable of filling the more than 3.6 million skilled jobs the Bureau of Labor Statistics estimates remain vacant in industries such as manufacturing — even at a time when more than triple that number of Americans are looking for work. Higher education, advocates say, can not only provide these newly minted workers with the critical-thinking skills they need for today’s jobs, but also leave them better prepared and more appealing to employers the next time things get tough. “What works so well about apprenticeships is that workers can gain tailored skills for the workplace along with critical academic learning, all while they earn a paycheck,” says Sen. Patty Murray, D-Wash., a champion of federal support for apprenticeship programs. What makes them a model, Murray said at a U.S. Department of Labor ceremony marking this year’s 75th anniversary of the National Apprenticeship Act, are those paychecks, plus the programs’ reliance on strong public and private partnerships and the combination of academic and on-the-job learning. Machinists these days have to operate sophisticated, computer-numerical-controlled equipment like the $3 million Makino vertical machining center that Seattle apprentice Irwin Downes has learned to run at JWD Machine in Fife, Wash. The company sent Downes and two other apprentices to Ohio to learn how to run the super lathe, which can cut titanium parts on several axes at once under high heat and jet sprays. Now the three are teaching the factory’s other 42 machinists how to use the time-saving machine to make critical parts for the aerospace industry. Ironworkers Union Local #86 instructor Kelly Graves readies a piece of equipment at the union's training center at Bates Technical College in Tacoma, Wash. The four-year apprenticeship now comes with the opportunity to earn an associate degree. Across the country in Virginia, at the sprawling Newport News Shipyard on the waterfront near where the James River spills into Chesapeake Bay, applications to the apprenticeship program have skyrocketed from barely 540 a dozen years ago to a record 6,300 this year. New apprentices spend two full days each week in college classes, while earning more than $30,000 to start and upwards of $50,000 by their fourth year. They spend the rest of the week on the waterfront learning one of 17 trades and helping build and repair the nation’s aircraft carriers and nuclear submarines. The best move on to advanced classes from which almost half will graduate with an associate degree from nearby Thomas Nelson Community College or Tidewater Community College, which teach some courses inside the shipyard gates and others back on their own campuses. 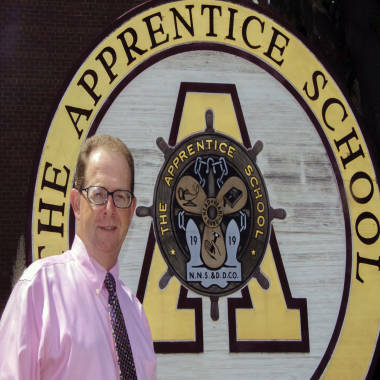 The shipyard’s Apprentice School has its own 17-member faculty as well as nearly 70 craft instructors. Of those 6,300 applicants, it takes 260 new apprentices each year — making it more selective than Harvard, Yale or Princeton. The shipyard, owned by Huntington Ingalls Industries, also looks to the Apprentice School for future supervisors, managers and executives. Danny Hunley, who enrolled as an apprentice welder at age 19 in 1974 and is now vice president of operations, says that “human supply chain” is particularly reliant on the community colleges. Hunley says he hopes that when the Apprentice School moves from its World War II-era brick building into a planned glass-and-steel showcase in downtown Newport News, it will even begin to offer bachelor’s degrees. Malachi Underwood, 27, an apprentice in the foundry shop, came to the shipyard in 2010 after being laid off from a job making wheels for railroad freight cars. “The things you do in the classroom here relate to what you do every day on the job. They make them real life,” says Underwood, who was recently tapped to leave the foundry and become a nuclear test technician. At the Newport News Shipbuilding Apprentice School in Virginia, new apprentices spend two full days in college classes each week while earning more than $30,000 a year. Director Everett Jordan, an alumnus (he was a shipfitter), says the college classes add "a critical dimension to our education here." Conversely, employers say the instruction their apprentices get in college classes is broader than what new workers can learn on the job alone. The colleges typically work with local industry to design their classroom programs. An Ironworkers Union Local #86 apprentice prepares to hoist a section of a steel beam to the second story of the building skeleton that students practice on at Bates Technical College in Tacoma, Wash. The same is true of the 6:30 a.m.-to-3:30 p.m. classes that the ironworker apprentices take in Tacoma, which occupy one month each year during their four-year apprenticeships. 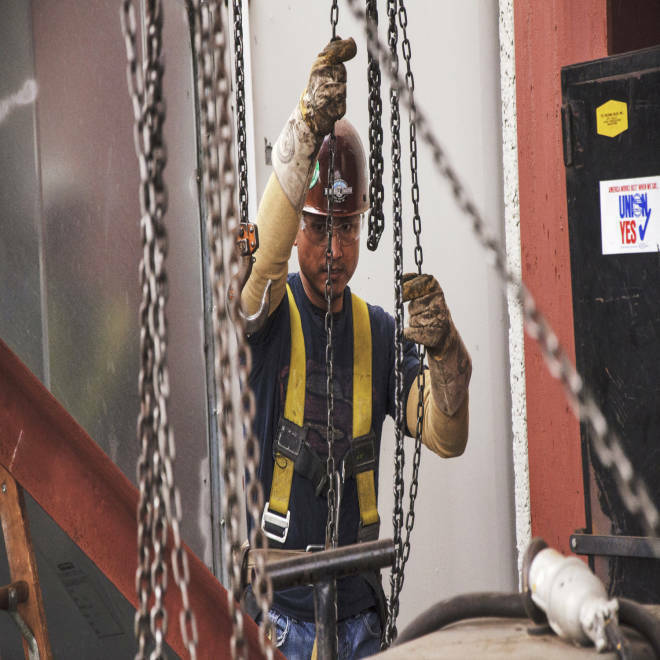 At the job sites where they spend the other 11 months, much of the trainees’ time may be spent carrying or tying rebar, or doing other hard, physical labor, rather than the more complicated work of following codes and blueprints. Some foremen and journeymen “have no problem explaining things so the apprentices build up knowledge as they go, but some do not,” says instructor Kelly Graves. He tells the apprentices that if they want to be superintendents, they’ll need college degrees. “The more education you have, the better off you are,” he says. Washington Gov. Chris Gregoire and the state legislature came up with $3 million to create the aerospace apprenticeship program in 2008, at a time of near-panic among employers about the aging of their skilled workers. Half of Boeing engineers are eligible to retire by 2015, and two-thirds of the company’s entire workforce is within a decade of retirement age. Yet employers have their work cut out to convince a new generation to enter these trades, says Laura Hopkins, the program’s executive director. For them, the promise of a college degree can be an inducement. Back at Bates, Jesica Bush is convinced she’s found the right calling. She wants to become a construction supervisor eventually and instruct apprentices herself. This story, "Economic reality marries age-old idea — apprenticeships — with college," was produced by The Hechinger Report, a nonprofit, nonpartisan education-news outlet based at Teachers College, Columbia University. It’s one of a series of reports about workforce development and higher education.